We are very excited to use this blog as a way to share hearing industry news, innovations and everything Baha-related with you – whether you’re already a Baha user or considering one. Cochlear Bone Anchored Solutions is the world leader in bone conduction. For more than 35 years, Baha bone conduction implants have connected people to the world of sound. With the Baha Systems, Cochlear provides people of all ages with superior hearing performance and innovative design features that represent the best in bone conduction hearing solutions. Everyone deserves to be connected to the world of sound. With the Baha Systems from Cochlear, you can. Please note that not all products mentioned are available in all countries. 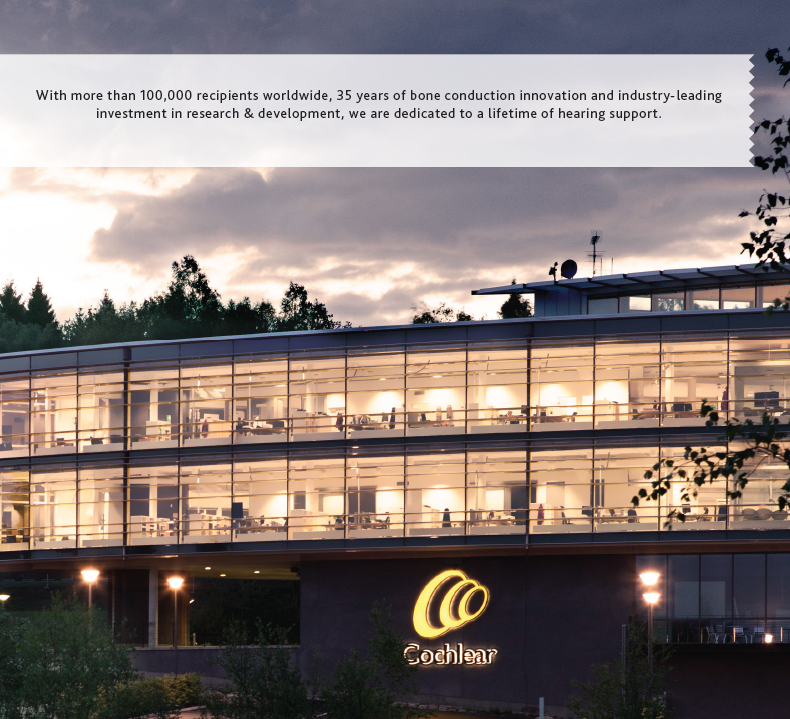 As the leading global expert in implantable hearing solutions, Cochlear is dedicated to bringing the gift of sound to people all over the world. For thirty years, Cochlear has pioneered this technology, helping more than a quarter of a million people reconnect to their families and friends. Along with the industry’s largest investment in research and development, we continue to partner with leading international researchers and hearing professionals, ensuring that we are at the forefront of hearing science. For our customers, that means access to our latest technologies throughout their lives, and the ongoing support they need. That is why seven out of ten people worldwide who choose a cochlear implant choose Cochlear as their hearing partner. I live in the UK and currently have an ordinary hearing aid but have been told that in November I can have a cochlear I feel this would look so much better than a big and bulky cochlear that we offer here how could I get one. Hi Vicky, thank you for your comment! I recommend you contact your local Cochlear customer care representative who will be able to better assist you with this question and give you the proper advice on how to move forward with getting a new Baha device. Hi – my wife’s baha 5 system doesn’t let her know of an incoming call as loud as it did previously. The only thing that has changed is that she loaded the latest iOS on her iPhone and it seems to have happened since then. Could this be the reason why she doesn’t hear the incoming calls very loud in her processor/ ear? During the call she can hear fine as before but she sometimes misses a call as she doesn’t hear it ring. Hi Jack, thank you for your question. The first thing to check is whether the phone ring is set to stream directly into the sound processor or whether she hears the phone ringing via the sound processor microphones. If it is and she is having problems hearing the person on the other line, then incoming call should be streamed and the problem is likely the volume level of the call, which is adjusted via the hard volume buttons on the side of the phone. Hi it turned out to be the volume setting of the ringer. I thought we had tried that already (it hadn’t been changed manually from when working previously) but obviously not. I believe it changed as part of the latest iOS update and we hadn’t realised. No worries, so glad you got it resolved! Hi once again I have an enquiry regarding my wife’s BAHA 5 hearing device. The battery door latches are quite flimsy (we were warned about this by the audiologist) and told it was a design flaw. We were told that if the door latch snaps it could be replaced quite easily. We were given a couple of spares. In just over a year my wife has had to replace the door 3 times. We have 1 spare door left now (an extra 1 obtained by ringing the local hospital). If we need more we can ring up again but it takes many attempts to get through on the phone. Are there any countermeasures for this concern yet ie door latch design improvements or other? Any hints on preventing the problem. My wife is quite gentle but the plastic is so thin on the latch!! You are right, the battery door has been a concern — I’m happy to say the concerns have been addressed and we have since designed and released a new and improved battery door. This should be available at your wife’s audiologist — next time you speak to them, make sure you double-check they are providing the new door and not past stock of the old door. The audiologist can order the new door from Cochlear if necessary. If you continue having issues with the battery door, give your local Cochlear customer care representative a call. Here is the contact for the UK customer care: http://www.cochlear.com/wps/wcm/connect/uk/home/support/customer-service. I hope this helps! Please comment again or email us at bahablog@cochlear.com if your issue remains unresolved. Thanks so much for getting back to me – I will let you know how we get on. No matter what the BAHA 5 and App technology is a fantastic piece of kit. Thanks Jack, please do let us know. I received my Baha 5 attract system two months ago, at the age of 73. I was born without a hearing canal in my left ear, but have had good hearing in my right ear all my life fortunately. When I hear with my Baha behind my left ear, I also get some some strong vibrations. I have found that’s if I turn the bass down to -6 on the Smart app, and turn the treble up to +4, I get better & clearer hearing without such strong vibrations. Are the vibrations normal & can I get my audiologist to make such changes to all the four programs in the processor? The way your Baha sound processor works is that it will pick up the sound in your environment, transform it to vibrations and send though the implant into the bone. The vibrations will then travel though the bone, bypassing your ear canal and middle ear, directly to the inner ear. However, even if the vibrations are normal you should not experience them as uncomfortable in any way, if so, the sound needs to be adjusted. I would recommend you to contact your audiologist. It is possible for your audiologist to make adjustments to all programs though a fitting software tool available at the clinic. It is also possible to redo some testing in the fitting software to recalculate the settings in the device. I hope this answers your question. Good luck.